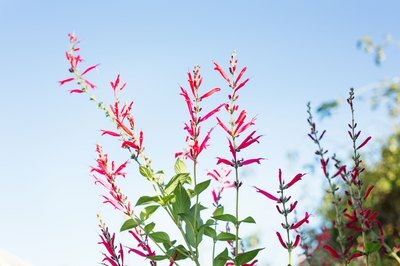 Grown for its fragrant foliage and showy, firecracker red flowers, pineapple sage (Salvia elegans) makes an attractive and low-maintenance addition to herb gardens and ornamental beds. It needs little attention and will thrive despite neglect, releasing its sweet scent that's similar to pineapple whenever its tender, light green leaves are brushed. 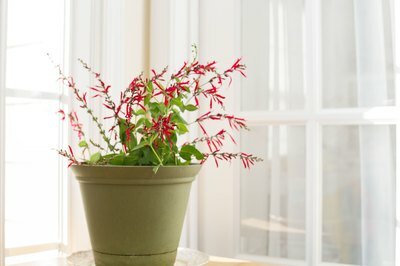 Pineapple sage will live a longer, healthier life with more prolific blooming if its needs are met. Pineapple sage grows well in U.S. Department of Agriculture plant hardiness zones 8 through 11, although its hardiness and growth cycle varies within that range. In USDA hardiness zone 8, pineapple sage dies back with the frost but will regenerate from the roots in spring after the soil warms. In USDA zones 9 and above, pineapple sage stays green year-round. Treat it as an annual in colder climates, or grow it in pots and bring it indoors for the winter. Pineapple sage performs best when grown in a sunny bed with organically rich, fast-draining soil. A plant grown in hot, dry climate will benefit from light midday shade to prevent wilting and sun scorch, but cultivars such as "Golden Delicious" (Salvia elegans "Golden Delicious") may lose their attractive foliage color if grown in deep shade. Pineapple sage plant grows 3 to 4 feet tall with a 2- to 3-foot spread, so space plants 24 to 36 inches apart to provide adequate room. Although moderately drought tolerant once established, pineapple sage will look better and bloom more spectacularly if it gets regular water during the growing season. 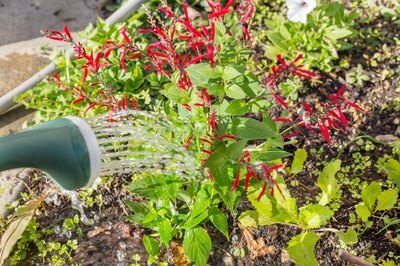 Provide 1 inch of water each week, allowing the soil to dry out beneath the surface between waterings. Pot-grown pineapples sage plants need more frequent watering and should be watered when the soil looks dry on the surface. Water until the excess dribbles from the pot. Always use a pot with drainage holes to prevent the roots from sitting in wet soil. Pineapple sage wilts easily and may lose its leaves during prolonged dry periods. It typically revives once watered, but try to avoid the plant wilting from lack of water. 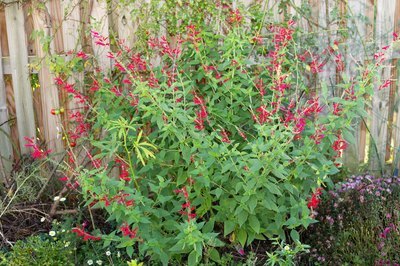 As with most sages, pineapple sage performs well without any fertilizer. In poor soil or in containers, a pineapple sage will benefit from regular fertilizer applications during the active growing season. 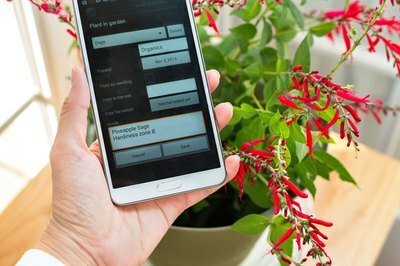 Use blooming fertilizer with an N-P-K number of 7-9-5. 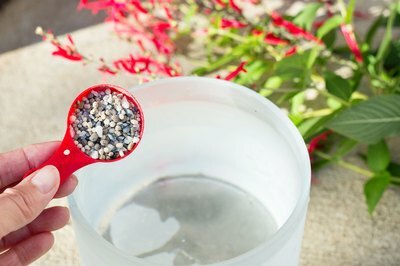 Mix the fertilizer at a rate of 1/4 teaspoon in 1 gallon of water in spring and 1/2 teaspoon in 1 gallon of water in summer. Replace one watering per week with the solution, applying it to previously moistened soil to avoid root burn. Stop feeding in fall and resume the following spring when new growth emerges. In USDA zones 9 through 11, pineapple sage requires no special winter care and many will bloom sporadically until spring. That is not the case in USDA zone 8 and below, where the plant will die completely if left outdoors. Cut back the pineapple sage by one-half in autumn and transplant it into a clay pot with multiple drainage holes at the base. Move it indoors near a bright, south-facing window where temperatures stay above 35 degrees Fahrenheit. Keep the plant on the dry side, only watering when it wilts slightly. In spring, move it back outdoors and transplant it into the garden or grow it in the pot all year. The University of Tennessee Institute of Agriculture: October 2013 Plant of the Month: Pineapple Sage Salvia Elegans "Golden Delicious"